6296 Shipwreck Island is a Pirates set released in 1996. 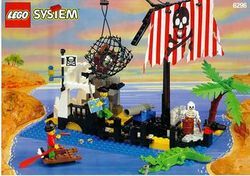 It contains 216 pieces to construct a "wrecked" ship with a working net, a crocodile and two pirate and skeleton minifigures. Facts about "6296 Shipwreck Island"
This page was last edited on 28 April 2016, at 22:18.